A noodle is a type of food made from unleavened dough that is cooked in a boiling liquid. 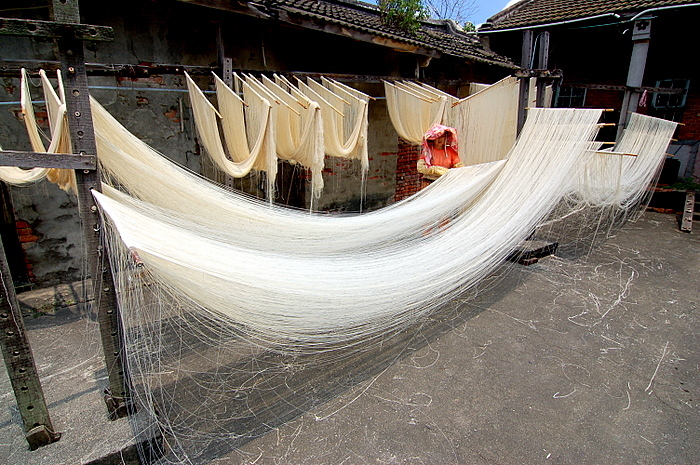 Depending upon the type, noodles may be dried or refrigerated before cooking. The word derives from the German Nudel (noodle) and may be related to the Latin word nodus (knot). In American English, noodles is a generic term for unleavened dough made from many types of ingredients. Noodles exist in an abundance of shapes and sizes. Wheat (e.g., Pasta, Spätzle, and others). Mung bean (e.g., Cellophane noodles). Potato or canna starch (e.g., Cellophane noodles, made from potato starch or canna starch; and Gnocchi).